We are proud to announce our collaborative work with OMRON Healthcare on the development of an integrated and cost-efficient approach to remote monitoring of patients in clinical trials. 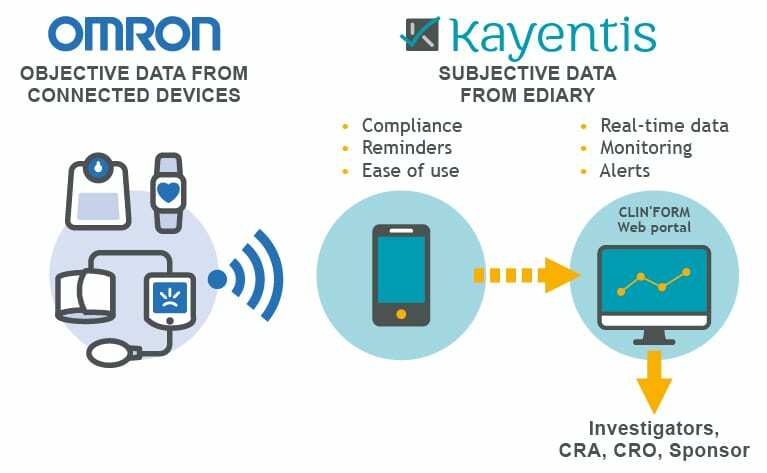 Combining the latest technology in connected devices from OMRON and the benefits of Kayentis’ advanced eCOA solutions, we have successfully developed an Integrated Electronic Data Service. This new and more economical approach will allow for higher patient engagement and retention, more and higher quality of patient data, and faster results. OMRON and Kayentis, each with their specialized expertise in the development of medical devices and applications as well as client services and experiences, are in a uniquely strong position where together they can tackle many of the challenges that come with the collection of patient data. Kayentis is a global provider of electronic Clinical Outcome Assessment (eCOA) solutions for patient data collection in clinical trials. Created in 2003, Kayentis has specialized in eCOA solutions since 2009, developing a full range of services and extending its solutions portfolio to support pharmaceutical companies, biotechnology companies and CROs. Today, with experience of more than 150 clinical trials in 75+ countries (6,500 sites and 50,000 patients) and in a broad range of therapeutic areas, Kayentis adds value to data quality and clinical trial efficiency with innovative and intuitive solutions. Please visit kayentis.com for more information. OMRON Healthcare is the Global No.1 brand in both blood pressure monitors, with over 200 million units sold, as well as nebulizers for respiratory treatment with over 30 million devices sold. The company’s additional core product categories are low-frequency pain therapy equipment, body composition monitors and electronic thermometers. OMRON Healthcare Group is headquartered in Kyoto, Japan. OMRON Healthcare Europe B.V. is the healthcare division for Europe, Russia, Middle East and Africa and provides services to customers in more than 74 countries.